A E. Ward and Son Ltd (Ward Gemstones) was established 70 years ago and has become the foremost name in the British gemstone industry, offering an efficient and reliable service for the supply and cutting of all gemstone and associated materials. As a company we endeavour to provide our customers with the most friendly, professional and knowledgeable service possible, as well as offering excellent value for money. Price lists are no longer available on this site. 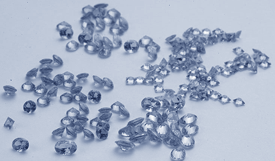 It is for gemstone information and other details of the service we offer. For current prices please visit our web shop. Website design and content ⰰ9 L.H. Maynard.